Three years ago, in the early days of this blog, I wrote a post about three Commodore 64 games I played frequently as a kid but never managed to beat. Coming back to them as an adult I discovered that it wasn’t that they were too advanced for me as a child, but that they were just bad games. They were full of lazy design choices, weird bugs, and had frustrating controls. Three years ago I managed to track down DOS versions of two of the games, The Amazing Spider-Man and X-Men: Madness in Murderworld, and was determined to beat them once and for all. Through pure stubbornness and sorely tested patience I managed to finally complete both games and my age-old grudge was satisfied– I’d never have to think about or play those awful games again. Something odd started to happen a few months later. 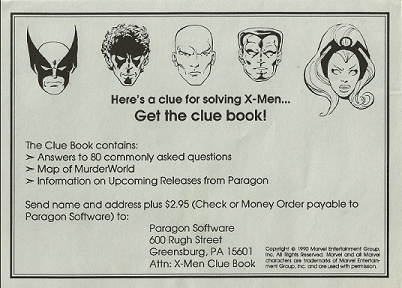 I began getting questions about how I beat X-Men: Madness in Murderworld. Apparently I wasn’t the only one who held a deep resentment about never finishing that game and many people were emailing me with questions about how I did it. And on, and on, and on. The problem was that once I had finished X-Men, since the game had been so terrible to re-live, I threw out my notes and maps. I was DONE, why would I care to keep those around? Even now, three years later, I still get tons of web traffic from people searching for help with X-Men: Madness in Murderworld. Last week, after someone sent me yet another email asking for a clue and another person commented on that old post, I knew I had to try once more. The worst part is that upon booting up the game this time around, within ten minutes of playing, I remembered how to solve the puzzle I had been stuck on. – Avoid combat whenever possible. Fighting in this game is straight-up broken. Hit detection doesn’t work half the time and it’s entirely possible for a tiny rat to absolutely murder your X-Men. Run, run away as fast as you can. You don’t get anything for fighting monsters so don’t do it. Each character has a flying forward leap (Wolverine’s and Cyclops’ are the best). Use it to exit the screen and get out of combat asap. – If you must fight, use Cyclops or Storm to shoot the monster from a distance and then flip away when they get close. Repeat. Most of the evil mutants are easy to beat this way. – A few monsters, like Sentinels, have ranged attacks. Use Wolverine and stay up close to the monster. Most of their shots will go right over him. – You must have everyone alive to beat the game. – Save. SAVE. Save constantly. If you have to fight something and it takes off a ton of health, reload and try again. This game is too long and too annoying to have to re-explore a bunch of rooms because you forgot to save. – There are a ton of items that I have no clue as to what they ultimately do. They weren’t needed to beat the game and I explored every room. This game is the worst. – It’s entirely possible to lose or destroy important and necessary items. Like the Demagnetizer at the end of the game. Did I mention that this game is the worst? figure out which one is used for which door on your own. It’s not hard. – Going up a hole in the ceiling can be annoying until I figured it out. Using Storm or Nightcrawler, don’t stand immediately under the hole, but off to the side a bit. Use their power on the hole directly. You’ll teleport to the same position on the floor above. – In the DOS version of the game I’m running, my X-Men never run low on their Mutant power and potions don’t seem to have an effect. Some sort of bug, but it means that I don’t know what the potions do exactly. – Fighting Magneto at the end is pretty tough. Though I was able to take advantage of a bug where Magneto tries to always back away from you as he shoots. If you force him right he gets stuck on the rock wall, not being able to walk through it, and you can just hang back and blast him with Storm or Cyclops. – If you thought any part of the game is annoying, the last three floors, after you get the code from the small box, are painful. There are a ton of keys and doors which force you to fight the creature in each room. Save before entering each and room and reload if the game screws you as it probably will. Whenever possible, use your “B” team to take damage—Colossus, Dazzler and Nightcrawler. * Put down power supply and use the power booster on it to create the power module. Pick it up. * Put down the BUD cable and use the coils on it to create the emitter. Pick it up. * Put down the emitter and use the controller on it to create the degausser. * Use the rest of the remaining parts on the degausser. * Cry softly in the corner. Let it out. Let it all out. You’ve just beat this terrible game. I’ve packaged my excel-drawn map as a pdf (with a map legend and item-use list as a separate pdf) with a lovely graphical map made up of screenshots a reader named David sent me ages ago. You can download them here. UPDATE: I received a request from someone asking if by chance I still had my save file from the end of the game, before you fight Magneto. I thought for sure they’d be out of luck but I did have it! So, if you’d like to beat this awful game without much of the fuss, here’s a save file. Sweet! Where does one find the DOS game now? Needs more ASCII art at the top. thanks! austin, hope can end the games soon.